When a drug has been around for many decades, tried and tested with few known ‘side-effects’, yet very helpful with a long list of conditions, there’s a good chance you won’t be hearing about it from your doctor. This becomes doubly true, if that same drug – cyproheptadine (Periactin) on this occasion – is beneficial in part because of its anti-serotonergic effects, when the official doctrine still sees serotonin as something wonderful. If the drug also helps to protect against the damaging effects of estrogen (the so called female hormone), medical cognitive dissonance will start to rise sharply. Add to that cyproheptadine’s endorphin, prolactin and growth hormone lowering, anti-cholinergic impact, and what you potentially have (rather than just some ‘outdated’ anti-histamine) is a health advice public relations nightmare. 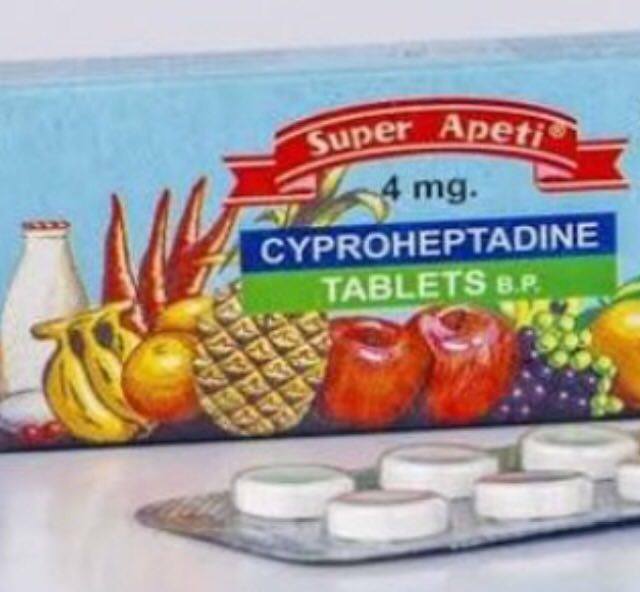 Regardless, cyproheptadine has been studied and used over many years for the treatment of serious and chronic metabolic issues and illnesses, with very few problems. It’s a long list, and it includes asthma; insomnia and other sleep related issues; depression and anxiety; schizophrenia; post-traumatic stress disorder; migraines and cluster headaches; IBS and other digestive issues; fertility issues; testosterone promotion; dyspeptic symptoms in children; functional abdominal pain; appetite stimulation; galactorrhea-amenorrhea syndrome; chronic spinal cord injury; serotonin syndrome; skin disorders; addiction; autism; heart issues; diabetes; hemorrhagic shock; ischemia; even a number of different kinds of cancer. So what is it then, that makes the medical world appear as though it is largely oblivious to this cheap and simple, first generation anti-histamine, and its multitude of beneficial effects. Do they know something that science doesn’t? The story becomes a little clearer, if you look more closely at the biological interrelationships between histamine, serotonin, cortisol, nitric oxide, estrogen and some other inflammatory by-products of chronic stress, or interference with thyroid energy metabolism. Protecting against rising levels of any one of the stress substances mentioned above, can sometimes be enough to push things in the direction of improved metabolic function. From that point of view, one logical way of understanding ‘cypro’ (as it is often lovingly referred to) can be to see it as a kind of all purpose anti-stress, pro-thyroid, pro-metabolism substance. The inflammatory things, including serotonin, histamine and estrogen, as well as endotoxin, prolactin, nitric oxide and lactic acid, are (in a variety of different ways) physiologically related, and have a tendency to promote each other. When stress is high, and when thyroid function is sub-optimal, many factors combine to create what can become a vicious circle type effect, which involves many of the stress, disease and degeneration promoting substances. Stress uses up sugar supplies rapidly, and when glycogen stores run low, cortisol and adrenalin rise in order to convert muscle tissue into sugar, and release fat out of storage as alternative fuel. Relying on cortisol to provide energy via the breakdown of muscle, and releasing fat made up increasingly of polyunsaturated fatty acids (PUFAs), has many inflammatory anti-thyroid effects. PUFA is a far greater part of modern diets than it ever was before, and as consumption increases, more is stored in the tissue over time, making up more of the composition of fat being released into circulation under stress. When thyroid metabolism is suppressed and energy systems are interfered with, the resulting increased release of the polyunsaturated free fatty acids is one of a number of things that then can cause a slowing of digestive processes, enabling bacteria to feed and grow in number. This can lead to a rise in exposure to bacterial endotoxin, which adds momentum to a metabolically suppressed, inflammatory scenario. This is often especially true, when sugar intake (or fuel generally) is being restricted. People often get away with restricting fuel intake for long periods of time, but relying upon the stress response can have many unintended consequences. The stress substances promote each other in an almost unlimited number of different ways. Thyroid suppression promotes bacterial endotoxin, and endotoxin can encourage histamine release. Histamine can increase nitric oxide. More nitric oxide (NO) leads to more prostaglandin production and more inflammation. Histamine can itself be inflammatory. Endotoxin also promotes cortisol, serotonin and estrogen, and serotonin and estrogen increase cortisol. Estrogen induces NO production, and promotes a rise in serotonin and endorphin levels. Serotonin mediates the actions of estrogen. Estrogen stimulates growth hormone production, and serotonin stimulates acetylcholine release. Acetylcholine increases NO, growth hormone, cortisol, histamine and prostaglandins. Prostaglandins can promote histamine, estrogen and beta-endorphin. Rising levels of these substances either directly or indirectly interfere with energy metabolism and promote stress, inflammation and disease. Cyproheptadine has been shown to be able to protect against bacterial endotoxin, histamine, cortisol, serotonin, estrogen, acetylcholine, growth hormone, beta-endorphin, as well as being able to prevent the synthesis from free fatty acids, of the prostaglandins. Strange to imagine how something that discourages so many wonderful ‘happiness promoting’ substances, could be so beneficial. 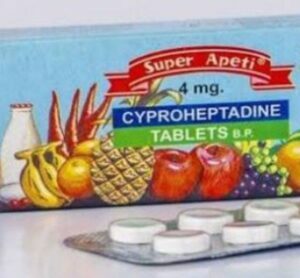 By protecting against endotoxin, estrogen and serotonin for example, cyproheptadine helps to take the strain off the liver, allowing it to better carry out detoxification functions, further reducing circulation of the metabolism interfering, stress and inflammation promoting substances, including in particular estrogen. Improving liver function can go a long way towards assisting thyroid and mitochondrial energy systems to start to perform more effectively, and protect against stress in general. Excessive exposure to the byproducts of PUFA breakdown (including the inflammatory prostaglandins), and chronically high circulation of endotoxin, serotonin, cortisol and estrogen, damage the liver and have been demonstrated to be involved in the development of cancer, including liver, breast, colon, prostate, pancreatic and other kinds of cancer. Histamine, growth hormone, acetylcholine and prolactin have also been shown to be involved in the promotion of cancer as well as numerous other disease processes. There are a lot of really good reasons to be looking at cyproheptadine when it comes to protection against diseases like cancer, and just metabolic health in general. Protecting against the promoters of stress and inflammation can go a long way towards creating the possibility of a change in direction away from spiraling degeneration, and general ill health in its many potential incarnations, towards a state of improving metabolic function leading to healing and recovery. Cyproheptadine has been used to promote the production of cholesterol and testosterone, and there is good reason to believe that by protecting against the stress and inflammation promoting substances and encouraging thyroid metabolism, it can (indirectly at least) assist in the production of some of the other protective anti-aging hormones, including pregnenolone, progesterone and DHEA. If it were to become widely accepted that protecting against serotonin and estrogen for instance, can be an important part of a metabolism enhancing, general disease protective strategy, and that this could be achieved with the assistance of a very cheap, safe and easily available anti-histamine, some people would probably not be too happy. For starters, this has the potential to interfere with the sale of a number of the more profitable pharmaceutical products, including the serotonin promoting, so called anti-depressants, estrogen increasing drugs, and various highly priced forms of chemotherapy. Possibly even more of an issue, is the manner in which the acceptance of biological science contradicting or undermining the ‘official’ approach to prevention and treatment of lots of diseases and conditions, can threaten the status quo. In any case, not everyone reacts well to even the safest drugs, and some prefer not to risk taking them if it isn’t absolutely necessary. Cyrpoheptadine has some potential dopamine lowering effects, and also makes some people feel extremely drowsy, at least at first. For those people who would rather not use it, it is possible to replicate some of the stress lowering effects of cyproheptadine with dietary and other pro-thyroid means. Unfortunately there is as much confusion and misinformation regarding what is considered to be a healthy pro-metabolic anti-stress diet, as there is when it comes to many kinds of drug recommendations. There is plenty of good quality biological evidence demonstrating a strong relationship between improvements in thyroid energy metabolism, and overall stress reduction and disease protection. As metabolism improves and stress and inflammation are reduced, chronically high levels of the stress substances (including serotonin, estrogen, cortisol, and histamine) are reduced systemically, rising locally and temporarily as required. Improved production of the protective hormones (pregnenolone, progesterone, testosterone and DHEA) tends to go hand in hand with better thyroid performance. Sugar intake plays a role in the fueling of thyroid energy metabolism. Sufficient sugar consumption keeps cortisol low, and inhibits the release of PUFA into circulation. Sugar helps to promote digestion and liver function, reducing inflammation, keeping endotoxin, serotonin and estrogen under control, and assisting in the production of cholesterol and other disease protective substances. By protecting against stress, sugar prevents excessive catabolization of muscle tissue, reducing circulating tryptophan (as well as the mobilization of other inflammatory amino acids) and protecting against excessive serotonin production. A diet avoiding PUFA, with enough protein from milk, cheese and gelatin, and plenty of sugar from sweet ripe juicy fruits, fruit juice, honey and white sugar, can help improve thyroid metabolism, and protect against the damaging effects of stress and inflammation, limiting serotonin, estrogen, histamine and other stress substances, providing similar results as cyproheptadine use. Together they can potentially have a synergistic impact. Some other things that have been shown to help in related ways include lysine, theanine, certain antibiotics, activated charcoal, carrot salad, famotidine, very well cooked mushrooms, coconut oil, methylene blue, aspirin, niacinamide, glycine, caffeine and numerous other anti-stress pro-metabolic substances. I’m not a doctor or a scientist, and I’m not here to make drug recommendations (or any recommendations for that matter), but rather to point out the fact that if you look at what’s underneath many modern health guidelines, you’ll find a long history of science that helps to explain why the guidelines often aren’t helping, but instead cause more harm. Cyproheptadine/Periactin is more than just a simple anti-histamine. It’s a reminder to the world that there is something right with decades worth of largely ignored biological science, and something wrong with many of the so called ‘scientific’, officially backed health, dietary and treatment guidelines being heavily backed and promoted. Perhaps that’s why almost nobody is raving about it. Anti-endotoxic shock effects of cyproheptadine in rats. Modification of adrenal function by the anti-serotonin agent cyproheptadine. Effect of cyproheptadine on the spontaneous diurnal variations of plasma ACTH-cortisol and ACTH-GH secretion induced by l-dopa. Effect of the antiserotonin drug, cyproheptadine, on plasma beta-endorphin and beta-lipotropin in patients with Itsenko-Cushing’s disease. Suppression by cyproheptadine of human growth hormone and cortisol secretion during sleep. Cyproheptadine-induced remission of Cushing’s disease. Unexpected remission of hepatocellular carcinoma (HCC) with lung metastasis to the combination therapy of thalidomide and cyproheptadine: report of two cases and a preliminary HCC cell line study. Cyproheptadine reduces or prevents ischemic central nervous system damage. Cholinergic receptors as target for cancer therapy in a systems medicine perspective. The effect of cyproheptadine on the release of corticotrophin releasing factor. Suppression of aldosterone by cyproheptadine in idiopathic aldosteronism. Brain cholesterol and phospholipid levels in cyproheptadine treated albino rats. Cortisol and androgen secretion in a case of Nelson’s syndrome with paratesticular tumors: response to cyproheptadine therapy. Tumor-Associated Neutrophils and Macrophages Promote Gender Disparity in Hepatocellular Carcinoma in Zebrafish. Effect of cyproheptadine on episodic ACTH and cortisol secretion. Treatment of the serotonin syndrome with cyproheptadine. [The bromocriptine-cyproheptadine combination in the treatment of psoriasis. Preliminary note]. Effect of cyproheptadine on asthmatic children. Study of appetite, weight gain, and linear growth. Prolactin and breast cancer risk. The mechanism of action of cyproheptadine on prolactin release by cultured anterior pituitary cells. Effect of cyproheptadine on thyrotrophin and prolactin secretion in normal man. Cyproheptadine-mediated inhibition of growth hormone and prolactin release from pituitary adenoma cells of acromegaly and gigantism in culture. Antagonism of prostaglandins induced uterine contraction by cyproheptadine hydrochloride. Interactive effect of histamine and prostaglandin D2 on nasal allergic symptoms in rats. Cyproheptadine for prevention of neuropsychiatric adverse effects of efavirenz: a randomized clinical trial. Treatment of depression with cyproheptadine. Diffuse cutaneous mastocytosis responding to cyproheptadine. Serotonin promotes tumor growth in human hepatocellular cancer. Inhibition of bovine cerebral cortex prostaglandin synthetase by phenoxybenzamine and cyproheptadine in vitro. Comparative anticholinergic activities of 10 histamine H1 receptor antagonists in two functional models. Anticonvulsant efficacy of antihistamine cyproheptadine in rats exposed to the chemical warfare nerve agent soman. Systemic mastocytosis treated with histamine H1 and H2 receptor antagonists. Increased blood-brain barrier permeability following acute short-term swimming exercise in conscious normotensive young rats. Bivalent role of intra-platelet serotonin in liver regeneration and tumor recurrence in humans. Cyproheptadine may act at the pituitary in Cushing’s disease: evidence from CRF stimulation. An antidepressant that extends lifespan in adult Caenorhabditis elegans. Cyproheptadine: A Potentially Effective Treatment for Functional Gastrointestinal Disorders in Children. Cyproheptadine displays preclinical activity in myeloma and leukemia. Cyproheptadine Use in Children With Functional Gastrointestinal Disorders. Effects of dexamethasone, cyproheptadine, anisodamine, and dinoprostone on TNF alpha production in endotoxic shock. Suppressive effects of antihistaminic and/or anti-PAF agents on passive anaphylactic shock in mice sensitized with allogeneic monoclonal IgE and IgG1 antibodies and hyperimmune serum. Treatment of primary erythromelalgia with cyproheptadine. Long-term trial of cyproheptadine as an appetite stimulant in cystic fibrosis. Identification of Cyproheptadine as an Inhibitor of SET Domain Containing Lysine Methyltransferase 7/9 (Set7/9) That Regulates Estrogen-Dependent Transcription. Histamine upregulates the expression of inducible nitric oxide synthase in human intimal smooth muscle cells via histamine H1 receptor and NF-kappaB signaling pathway. Inhibitory effects of antihistamines and antiserotonins on the bone marrow reactions produced by Escherichia coli endotoxin in mice. Cyproheptadine and desmethylcyproheptadine directly inhibit the release of adrenocorticotrophin and beta-lipotrophin/beta-endorphin activity from the neurointermediate lobe of the rat pituitary gland. Serotonin activates the hypothalamic-pituitary-adrenal axis via serotonin 2C receptor stimulation. Cyproheptadine exhibits antitumor activity in urothelial carcinoma cells by targeting GSK3β to suppress mTOR and β-catenin signaling pathways. Cyproheptadine in the management of the galactorrhea-amenorrhea syndrome. Effects of cyproheptadine, reserpine, and synthetic corticotropin-releasing factor on pituitary glands from patients with Cushing’s disease. Serotonin syndrome: early management with cyproheptadine. Inhibitory effects of cyproheptadine on pituitary-thyroid axis and pancreatic beta cells in rats. Opiate receptors, endorphins and drug therapy. Use of cyproheptadine in young children with feeding difficulties and poor growth in a pediatric feeding program. Expression of serotonin receptors and role of serotonin in human prostate cancer tissue and cell lines. Relationship between release of beta-endorphin, cortisol, and trauma severity in children with blunt torso and extremity trauma. Protective effects of cyproheptadine on calcium paradox in isolated rat hearts. Verapamil, cyproheptadine, and anisodamine antagonized [Ca2+]i elevation induced by TNFalpha in a single endothelial cell. The calcium antagonist properties of cyproheptadine: implications for antimigraine action. Cyproheptadine is an effective appetite stimulant in cystic fibrosis. Effects of cyproheptadine on TXB2 and 6-keto-PGF1 alpha plasma levels in rabbits with hemorrhagic shock. The role of serotonin (5-hydroxytryptamine1A and 1B) receptors in prostate cancer cell proliferation. Serotonin and the regulation of hypothalamic-pituitary-adrenal axis function. Serotonin-mediated increases in the extracellular levels of beta-endorphin in the arcuate nucleus and nucleus accumbens: a microdialysis study. Effect of cyproheptadine on endotoxin-induced pulmonary platelet trapping. Effect of antiserotonin drug on the development of lung fibrosis and blood system reactions after intratracheal administration of bleomycin. Cyproheptadine for the treatment of functional abdominal pain in childhood: a double-blinded randomized placebo-controlled trial. Effects of the serotonin receptor antagonist cyproheptadine on the activity and pharmacokinetics of 5,6-dimethylxanthenone-4-acetic acid (DMXAA). The effect of naloxone and cyproheptadine on pulmonary platelet trapping, hypotension, and platelet aggregability in traumatized dogs. Antisecretory effect of prescribed appetite stimulator drug cyproheptadine in rat intestine. Effect of cyproheptadine hydrochloride on spermatogenesis. Serotonin involvement in the antitumour and host effects of flavone-8-acetic acid and 5,6-dimethylxanthenone-4-acetic acid. Activation of Meningeal 5‐HT2B Receptors: An Early Step in the Generation of Migraine Headache? Circulating estradiol, but not testosterone, is a significant predictor of high-grade prostate cancer in patients undergoing radical prostatectomy. Histamine mediates the pro-inflammatory effect of latex of Calotropis procera in rats. Preventive effect of cyproheptadine hydrochloride in refractory patients with frequent migraine. The use of antiserotonin-cyproheptadine HCL in pregnancy: an experimental and clinical study. Improved oral glucose tolerance following antiserotonin treatment in patients with chemical diabetes. The anti-histaminic cyproheptadine synergizes the antineoplastic activity of bortezomib in mantle cell lymphoma through its effects as a histone deacetylase inhibitor. A study of cyproheptadine in the treatment of metastatic carcinoid tumor and the malignant carcinoid syndrome. The effect of cyproheptadine hydrochloride (periactin) and megestrol acetate (megace) on weight in children with cancer/treatment-related cachexia. Anti-spasmogenic effect of cyproheptadine on guinea-pig ileum. PHARMACOLOGICAL BASIS FOR THE USE OF CYPROHEPTADINE (PERIACTIN) IN BRONCHIAL ASTHMA. Carcinoid myopathy. Serotonin-induced muscle weakness in man? Factor Xa as an interface between coagulation and inflammation. Molecular mimicry of factor Xa association with effector cell protease receptor-1 induces acute inflammation in vivo. A retrospective review of cyproheptadine for feeding intolerance in children less than three years of age: effects and side effects. Cyproheptadine prevents pergolide-induced valvulopathy in rats: an echocardiographic and histopathological study.